Definition at line 108 of file nt_native.h. Definition at line 114 of file nt_native.h. Referenced by AtapiRegCheckParameterValue(), AtapiRegGetStringParameterValue(), CdRomCheckRegistryForMediaChangeValue(), CdRomGetDeviceParameter(), ClassGetDeviceParameter(), ClasspIsMediaChangeDisabledDueToHardwareLimitation(), ClasspIsMediaChangeDisabledForClass(), ClasspMediaChangeDeviceInstanceOverride(), ClasspScanForSpecialInRegistry(), ClassQueryTimeOutRegistryValue(), Ext2QueryGlobalParameters(), FreeBT_GetRegistryDword(), InitBadBlocks(), IopActionConfigureChildServices(), IsOffline(), MountmgrReadNoAutoMount(), NpInitializeAliases(), RtlpCallQueryRegistryRoutine(), ScsiClassQueryTimeOutRegistryValue(), test_RtlQueryRegistryValues(), TestRtlQueryRegistryValues(), USBH_RegQueryGenericUSBDeviceString(), and USBPORT_GetDefaultBIOSx(). Definition at line 115 of file nt_native.h. Definition at line 113 of file nt_native.h. Referenced by AtapiRegCheckParameterValue(), AtapiRegGetStringParameterValue(), CdRomCheckRegistryForMediaChangeValue(), CdRomGetDeviceParameter(), ClassGetDeviceParameter(), ClasspIsMediaChangeDisabledDueToHardwareLimitation(), ClasspIsMediaChangeDisabledForClass(), ClasspMediaChangeDeviceInstanceOverride(), ClasspScanForSpecialInRegistry(), ClassQueryTimeOutRegistryValue(), Ext2QueryGlobalParameters(), FreeBT_GetRegistryDword(), InitBadBlocks(), IopActionConfigureChildServices(), IopAttachFilterDrivers(), IsOffline(), MountmgrReadNoAutoMount(), NpInitializeAliases(), RtlpCallQueryRegistryRoutine(), ScsiClassQueryTimeOutRegistryValue(), test_RtlQueryRegistryValues(), TestRtlQueryRegistryValues(), USBH_RegQueryGenericUSBDeviceString(), and USBPORT_GetDefaultBIOSx(). Definition at line 112 of file nt_native.h. Referenced by AtapiRegCheckParameterValue(), AtapiRegGetStringParameterValue(), CdRomCheckRegistryForMediaChangeValue(), CdRomGetDeviceParameter(), ClassDeviceControl(), ClassGetDeviceParameter(), ClasspIsMediaChangeDisabledDueToHardwareLimitation(), ClasspIsMediaChangeDisabledForClass(), ClasspMediaChangeDeviceInstanceOverride(), ClasspScanForSpecialInRegistry(), ClassQueryTimeOutRegistryValue(), DiskAddDevice(), DriverEntry(), EnumerateDevices(), Ext2QueryGlobalParameters(), Ext2QueryVolumeParams(), FFSQueryParameters(), FreeBT_GetRegistryDword(), GetComputerNameExW(), GetDriverName(), HasNoDriveLetterEntry(), InitBadBlocks(), IopActionConfigureChildServices(), IopAttachFilterDrivers(), IopLoadServiceModule(), IopLoadUnloadDriver(), IopUnloadDriver(), IsOffline(), MountmgrReadNoAutoMount(), MountMgrScrubRegistry(), MountMgrUniqueIdChangeRoutine(), NdisIAddDevice(), NpInitializeAliases(), NtfsQueryMftZoneReservation(), PnpRootCreateDevice(), QueryParameters(), QuerySymbolicLinkNamesFromStorage(), QueryTimeout(), RfsdQueryParameters(), RtlpCallQueryRegistryRoutine(), RtlQueryRegistryValues(), RtlQueryTimeZoneInformation(), ScConnectControlPipe(), ScmCreateOrReferenceServiceImage(), ScsiClassQueryTimeOutRegistryValue(), test_RtlQueryRegistryValues(), USBH_RegQueryGenericUSBDeviceString(), USBPORT_GetDefaultBIOSx(), and ViLoadImagesFromRegistry(). Definition at line 110 of file nt_native.h. Referenced by AtapiRegCheckParameterValue(), AtapiRegGetStringParameterValue(), CdRomCheckRegistryForMediaChangeValue(), CdRomGetDeviceParameter(), ClassDeviceControl(), ClassGetDeviceParameter(), ClasspIsMediaChangeDisabledDueToHardwareLimitation(), ClasspIsMediaChangeDisabledForClass(), ClasspMediaChangeDeviceInstanceOverride(), ClasspScanForSpecialInRegistry(), ClassQueryTimeOutRegistryValue(), DiskAddDevice(), DriverEntry(), EnumerateDevices(), Ext2QueryGlobalParameters(), Ext2QueryVolumeParams(), FFSQueryParameters(), FreeBT_GetRegistryDword(), GetComputerNameExW(), GetDriverName(), InitBadBlocks(), IopActionConfigureChildServices(), IopAttachFilterDrivers(), IopLoadServiceModule(), IopLoadUnloadDriver(), IopUnloadDriver(), IsOffline(), MountMgrQuerySystemVolumeName(), MountmgrReadNoAutoMount(), NdisIAddDevice(), NpInitializeAliases(), NtfsQueryMftZoneReservation(), PnpRootCreateDevice(), QueryParameters(), QueryTimeout(), RfsdQueryParameters(), RtlpCallQueryRegistryRoutine(), RtlQueryRegistryValues(), RtlQueryTimeZoneInformation(), ScConnectControlPipe(), ScmCreateOrReferenceServiceImage(), ScsiClassQueryTimeOutRegistryValue(), test_RtlQueryRegistryValues(), USBH_RegQueryGenericUSBDeviceString(), USBPORT_GetDefaultBIOSx(), VideoPortGetRegistryParameters(), and ViLoadImagesFromRegistry(). Definition at line 54 of file rtltypes.h. Definition at line 111 of file nt_native.h. Referenced by AtapiRegCheckParameterValue(), AtapiRegGetStringParameterValue(), CdRomCheckRegistryForMediaChangeValue(), CdRomGetDeviceParameter(), ClassDeviceControl(), ClassGetDeviceParameter(), ClasspIsMediaChangeDisabledDueToHardwareLimitation(), ClasspIsMediaChangeDisabledForClass(), ClasspMediaChangeDeviceInstanceOverride(), ClasspScanForSpecialInRegistry(), ClassQueryTimeOutRegistryValue(), CreateGroupListRoutine(), DeleteFromLocalDatabase(), DiskAddDevice(), DriverEntry(), EnumerateBiosDiskEntries(), EnumerateDevices(), Ext2QueryGlobalParameters(), Ext2QueryVolumeParams(), FFSQueryParameters(), FreeBT_GetRegistryDword(), GetComputerNameExW(), GetDriverName(), InitBadBlocks(), IopActionConfigureChildServices(), IopAttachFilterDrivers(), IopLoadServiceModule(), IopLoadUnloadDriver(), IopUnloadDriver(), IsOffline(), MountMgrQuerySystemVolumeName(), MountmgrReadNoAutoMount(), NdisIAddDevice(), NpInitializeAliases(), NtfsQueryMftZoneReservation(), PnpRootCreateDevice(), QueryParameters(), QueryTimeout(), QueryUniqueIdFromMaster(), RfsdQueryParameters(), RtlpCallQueryRegistryRoutine(), RtlQueryRegistryValues(), RtlQueryTimeZoneInformation(), ScConnectControlPipe(), ScmCreateGroupList(), ScmCreateOrReferenceServiceImage(), ScsiClassQueryTimeOutRegistryValue(), test_RtlQueryRegistryValues(), USBH_RegQueryGenericUSBDeviceString(), USBPORT_GetDefaultBIOSx(), VideoPortGetRegistryParameters(), and ViLoadImagesFromRegistry(). Definition at line 109 of file nt_native.h. 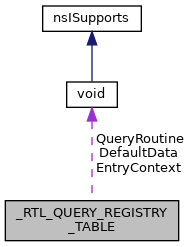 Referenced by ClasspIsMediaChangeDisabledDueToHardwareLimitation(), CreateGroupListRoutine(), DeleteFromLocalDatabase(), DeleteNoDriveLetterEntry(), DeleteRegistryDriveLetter(), EnumerateBiosDiskEntries(), EnumerateDevices(), Ext2QueryGlobalParameters(), HasNoDriveLetterEntry(), InitBadBlocks(), IopAttachFilterDrivers(), MountMgrQuerySystemVolumeName(), MountMgrScrubRegistry(), MountMgrUniqueIdChangeRoutine(), NpInitializeAliases(), QuerySymbolicLinkNamesFromStorage(), QueryUniqueIdFromMaster(), RtlpCallQueryRegistryRoutine(), RtlQueryRegistryValues(), ScmCreateGroupList(), test_RtlQueryRegistryValues(), USBH_RegQueryGenericUSBDeviceString(), USBPORT_GetDefaultBIOSx(), and VideoPortGetRegistryParameters().